Illinois State Police have released results of occupant restraint enforcement patrols held in Vermilion County on Monday (February 4th). District 10 Commander, Captain Louis Kink, says troopers issued 20 safety belt citations and 2 child restraint citations. They also gave 14 written warnings. 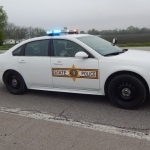 The enforcement project is funded through the Illinois Department of Transportation. The Occupant Restraint Enforcement Patrols provide extra patrol coverage so officers can focus on making sure all vehicle occupants are buckled up.